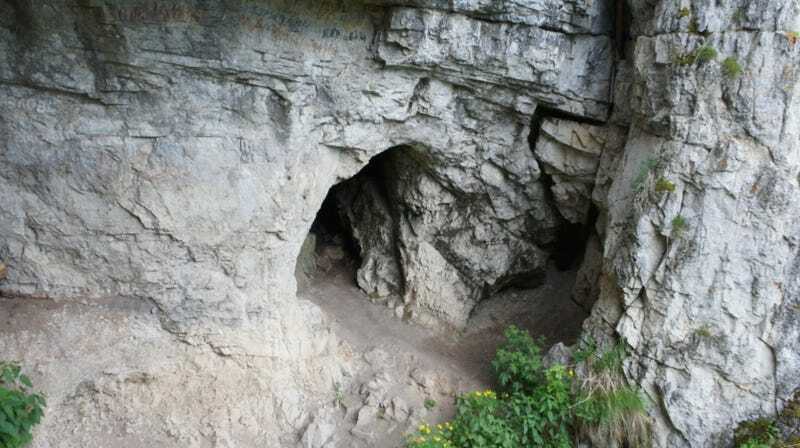 The entrance to the Altai cave in Siberia where a Denisovan fossil was found in 2008. Buried deep within the DNA of Asian individuals is a genetic clue pointing to the existence of an unknown human ancestor. Remarkably, it wasn’t a human who reached this startling conjecture, but rather an artificially intelligent algorithm. Welcome to archaeology in the 21st century. This idea isn’t new. In 2016, a genetics study co-authored by Mayukh Mondal from Tartu University and Jaume Bertranpetit from Pompeu Fabra University—both of whom were involved in the new study as well—offered evidence showing that indigenous Australasian populations from South and Southeast Asia “harbor a small proportion of ancestry from an unknown extinct hominin, and this ancestry is absent from Europeans and East Asians.” Their new study is an attempt to show where this “small proportion of ancestry” came from. To that end, Mondal and Bertranpetit submitted evidence in the form of a demographic analysis, one churned by deep learning and sprinkled with some statistical analysis. Their algorithm devised and compared numerous complex demographic models to make predictions about the history of interbreeding events in Eurasia. To do so, the researchers fed the algorithm a healthy diet of whole genome sequences derived from both contemporary and ancient DNA, enabling the neural network to create a large set of possible demographic histories. A statistical analysis then calculated which of these histories were the most probable. The piecing together of this genetic jigsaw puzzle yielded the proposed “third archaic introgression,” meaning a third hybridization event among ancient humans (the other two being the genetic mixture between modern humans and Neanderthals and modern humans with Denisovans). Modern humans interbred with an unknown third species, and according to the models it’s either a Neanderthal-Denisovan hybrid, or an early offshoot of the Denisovan lineage. That Neanderthals and Denisovans, who share a common ancestor, may have interbred is not an outrageous suggestion. Last year, scientists discovered the 90,000-year-old remains of one such hybrid individual—a girl with a Neanderthal mom and Denisovan dad. Due to a lack of evidence, scientists aren’t sure if this was a one-off thing, or if Neanderthals and Denisovans interbred on the regular. The new study bolsters the suggestion that the two extinct species bred often enough to produce a genetically distinguishable hybrid population. Serena Tucci, an ecologist and evolutionary biologist from Princeton University, said the new study reminded her of her own research from last year, though the authors used a different approach. Tucci and her colleagues used genetic evidence to show that early modern humans mated with Denisovan populations on at least two different historical occasions, which means the lingering traces of Denisovan DNA embedded in the genomes of Asian populations living today are derived from at least two distinct Denisovan populations. As for claiming the existence of some unknown human species, Tucci said the authors of the new study should refrain from conjecturing beyond the available evidence. No doubt, more evidence is needed. At the very least, however, these latest studies should encourage archeologists to be on the lookout for more clues pointing to the existence of the hypothesized species. As a final word, the use of AI in archaeogenetics is a very cool development, and likely a sign of innovative research methods to come. Editor’s note: This article has been updated to change references to “hominid” to “hominin.” While the term hominid encompasses all great apes (including humans) and their ancestors, scientists now prefer the term hominin to refer specifically to humans and their ancestors. Smithsonian has a great article about the evolving vocabulary. Thanks to reader Scott Hatfield for pointing out this change in usage.